Do you have an eye for great art? Find out in Masters Gallery where you will buy, sell, and ultimately influence the values of great masterpieces created by the world's finest Old World artists. The game cards in Masters Gallery feature 30 famous works of art painted by Jan Vermeer, Edgar Degas, Claude Monet, Pierre-Auguste Renoir, and Vincent Van Gogh. Players of the game are at the same time art critics and gallery owners whose goal is to make a profit in both roles over the course of four rounds. A painting from each player's hand is put up for auction each round. Some cards allow you to play an additional card, draw an extra card, or even increase the value of an artist. A round ends when a cumulative total of six Masterpiece cards of one artist are on the table. Players then score their Masterpieces - the more Masterpieces there are of a given artist, the higher the value of each of his works. The broker with the highest point total wins the game. 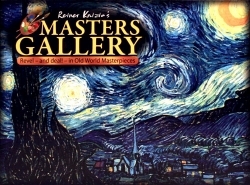 Masters Gallery was designed by master game creator Reiner Knizia and has the same gameplay as Modern Art: The Card Game. It is a 2010 Games 100 Award Nominee. Note: Pen and paper are required for scoring, but are not included.